In 2010, Beetle Ranching volunteers from around the Neponset River Watershed and beyond carefully raised Galerucella calmariensis & G. pusilla beetles for this project to reduce exotic, invasive Purple loosestrife in the Fowl Meadow wetlands, Brookwood Farm, and at adjacent wetland areas. Over the years, these beetles and their offspring will feed on Purple loosestrife, causing it to decline and encouraging native wetland species to return. Beetle Release at Brookwood Farm, August 14, 2010. 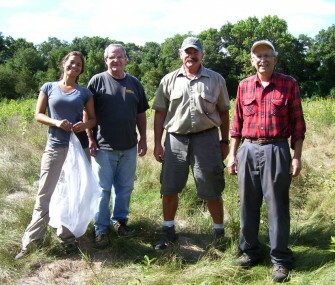 2010 was the third year of a collaborative five-year Purple loosestrife biocontrol project implemented by the Neponset River Watershed Association and the MA Department of Conservation & Recreation and guided by project advisor the MA Department of Ecological Restoration (formerly the Wetlands Restoration Program). Our goal is to increase diversity and presence of native wetland species at our treatment sites by reducing the presence of exotic, invasive Purple loosestrife. We cultivate beetles with an aim to release about 10,000 of them per Purple loosestrife-populated acre. We treat 20+ acres of affected wetland. Beetle release numbers were suggested by MA DER and the general literature. Likewise, we follow the beetle propagation, release and monitoring protocols of the University of Minnesota Extension Service and the University of Connecticut Integrated Pest Management Program. The number of released cultivated beetles is difficult to ascertain because adult beetles emerge from the nurseries at different times, including after we’ve already placed the nurseries at our wetland treatment sites and removed the protective netting. A survey of literature indicates that 1,000 to 2,000 beetle offspring result from applying 10 to 15 beetles to each beetle nursery – e.g., a potted, netted Purple loosestrife plant. However, discussion with past Beetle Ranching Volunteers from other projects yields accounts of a couple of hundred beetles resulting per beetle nursery. In 2010, 50 Neponset Beetle-Ranching volunteers (e.g., individuals, students, families, classes, Scout troops, non-profit conservation organizations, etc.) inoculated just under 500 potted Purple loosestrife plants with approximately 12 to 15 seed beetles each. Later, we released the beetles’ progeny at two of our three wetland treatment sites. The beetles strengthened local populations of biocontrol beetles which descended from previous years’ releases and migrations. Their combined force creates self-sustaining beetle populations and reduces Purple loosestrife over the long-term at our sites. At the Brookwood farm treatment site, the great majority of the indicators monitored are trending in the desired direction during 2010, when compared to 2008. In fact, in 2010, Purple loosestrife cover was at 52% of its 2008 level. At the Milton Fowl Meadow site, the results are also positive, with strong reductions in stem count, stem length and total cover between 2008 and 2010. However, this good news is tempered by the increased vigor in flowering of the remaining plants, and presumably in producing seed, compared to 2008. Lastly, at the Hyde Park Fowl Meadow site, while the number of stems has declined modestly between 2008 and 2010, other indicators including total Purple loosestrife cover have increased slightly as compared to 2008. Flowering also has been more vigorous than in past years. Weather differences between project years vary the growing conditions for both Purple loosestrife and Galerucella, potentially resulting in differences in mortality, survival and reproduction rates for both the plants and their biocontrol agents. Purple loosestrife may start, earlier or later in the year, to grow, leaf-out, bloom, and die-back, depending on the weather. The timing affects the availability of food resources for Galerucella, and so most likely their survival, reproduction, migration and mortality rates. Flooding from spring rains (significant in spring 2010, especially at the Milton-Fowl Meadow treatment site) may have increased mortality of hibernating Galerucella. And, earlier-than-usual hot weather during the early spring most certainly sped-up the growth and flowering of Purple loosestrife by several weeks, as it did vegetation in general in Metro Boston. Did the weather also speed-up the date of emergence of Galerucella? This year, we witnessed the first evidence of Galerucella on April 30 — chew-holes on young Purple loosestrife at Brookwood Farm. In 2009, we observed Galerucella beetles first during the first week in May. Variation in predation on Galerucella. Variation in predation could affect the size of the beetle populations and their effect on Purple loosestrife. More or less predators could be predating on Galerucella: new predators might have begun to feed on the beetles or regular predators might have fed more – or less, or stopped feeding entirely – on the biocontrol beetles. Migration of Galerucella. Galerucella migrate to and away from our treatment sites in their search for Purple loosestrife on which to feed, affecting population numbers at our treatment sites and therefore the effects on Purple loosestrife. Potential reduced number of cultivated Galerucella. Our last shipment of seed beetles in 2010 suffered damage during transit; some of the beetles were unintentionally released. As a result, we distributed fewer beetles per cultivated plant to our Beetle Ranchers, associated with that shipment. Thus, fewer beetle offspring overall may have been raised, leading to fewer beetles released in 2010, and thus potentially less effect on the Purple loosestrife. Year Three (2010) of our Project began with planning in late 2009, and hit the ground running in the winter and early spring months of 2010 when we began to recruit Beetle Ranching Volunteers. NepRWA publicized the volunteer opportunities to Watershed Association supporters, conservation sector colleagues, and to the general public through mass e-mails, press releases to local and regional newspapers, and on-line postings. Ultimately, we recruited 50 Beetle Rancher Volunteers and additional project volunteers, consisting of families, individuals, scout troops, elementary, middle and high school classrooms, organizations and businesses from throughout the Neponset River Watershed and Metro Boston. In the early spring, we purchased project equipment – kiddie pools, plant pots and stakes, potting soil, and net-making and -repair supplies. In March, we held volunteer training sessions, and in April, volunteers harvested Purple loosestrife rootballs at a local wetland, planted the rootballs in pots, and brought these home to maintain in kiddie pools. In mid-spring, some Beetle Ranchers and general project volunteers helped to repair beetle nursery nets from the previous field season and also sewed new nets. The first of our two staggered shipments of seed beetles arrived in late May, and our last arrived in late June. Volunteers gathered at our office to divide these beetles into small containers, which we immediately distributed to Beetle Ranchers. Starting in late June with a single beetle release, then starting up again in July and continuing into mid-August, we released new generations of cultivated beetles at treatment sites. In July, we monitored our study plots and recorded findings in data sheets produced by Cornell University. In November, we retrieved our plastic pots from the wetlands for use next year and the year after. The goal of the Fowl Meadow Purple Loosestrife Biological Control Project is to establish a self-sustaining population of Purple loosestrife biological control beetles (Galerucella calmariensis and G. pusilla beetles) in the northern Fowl Meadow Area of Critical Environmental Concern (Hyde Park and Milton) and at Brookwood Farm (Milton / Canton town line) to reduce the prevalence of exotic, invasive Purple loosestrife (Lythrum salicaria) plants over the long-term. The treatment areas are infested with Purple loosestrife. The properties are owned and managed by the Massachusetts Department of Conservation and Recreation (DCR), our project partner, and are located within the Neponset River Watershed and also the Blue Hills Reservation, a popular state park. We began this five-year project in 2008. Field Season 2010 marks our third project year. Two project years remain. The biocontrol beetles and their larvae feed on Purple loosestrife plants, causing stress to the plants and inhibiting robust plant growth and flowering. As a result, seed production and dispersal is limited or even prevented, reducing these Purple loosestrife’s negative impact on the wetlands both during that growing season and in the future. Were it not for the biological control beetles and their larvae, the Purple loosestrife would continue to out-compete native plants and gain dominance, reducing native plant diversity and the associated availability of high-quality habitat and food for native wildlife. With an eye toward producing long-term benefits, our project works to produce a self-sustaining beetle population at treatment sites by releasing beetles over five consecutive summers (the general literature recommends at least three to four years of beetles releases). The beetle population will reproduce and reappear at the release sites, each year, their numbers rising and falling according to the availability of Purple loosestrife. If necessary, the beetles will migrate away from the site (up to several miles) to find Purple loosestrife on which to feed, or they will die. The planned end result of our project – decreasing the presence of Purple loosestrife – would allow for an increase in quantity and diversity of native wetland flora, helping to restore habitat for a variety of native wildlife species, including state-listed endangered, threatened and special concern species. The project also raises public awareness about local wetlands – what wildlife live in them, the state that they are in, that they are important and biologically diverse landscapes, and how to help restore them. Additionally, the project empowers the public to help, in the form of providing a hands-on volunteer opportunity. For each year of Beetle-Ranching, we recruit, educate and organize volunteers, purchase supplies and “seed” beetles, cultivate (and, when needed – harvest additional beetles from the field) and release beetles, and monitor our treatment sites. We work with Beetle Ranching volunteers to: provide volunteer training (March); harvest Purple loosestrife plants from Conservation Commission- and landowner-approved wetland sites (April); plant the harvested rootballs in pots and grow them in backyard kiddie pools until late May and/or June, when we receive shipments of purchased seed beetles. We distribute these beetles to the volunteers, and they place the beetles on their netted plants. The volunteers continue to keep the water level up in their pools. Also during this time, we monitor our wetland treatment sites and record the presence of Purple loosestrife and other wetland plants as well as the presence of any biocontrol insects. Then, in July and early August, we release the offspring of our biocontrol insects at our treatment sites. In late summer, we conduct additional site monitoring of our treatment areas to assess how the Purple loosestrife fared over the growing season and what other plants are growing in the study plots. In this way, we track patterns of Purple loosestrife growth, biocontrol insect presence, and the presence of other wetland plants. Listen to or view a Living on Earth radio program segment on the Fowl Meadow Purple Loosestrife Biocontrol Project that was aired on National Public Radio. View project pictures. Read more about the project. We are very excited about the potential of this project to improve native biodiversity and ecological value of local wetlands and strengthen the constituency for wetlands restoration in the Greater Boston area. We are grateful to our funders for supporting this wetland restoration project and enabling the participation and collaboration of Neponset River Watershed and Metro Boston residents, businesses, schools, youth groups, non-governmental agencies and government departments in the restoration of a popular state park, the improvement of important wetland wildlife habitat, the protection of endangered, threatened and special concern species, and the encouragement of native species biodiversity. We look forward to a gradual and ever increasing diversity and presence of native plants and wildlife in local wetlands as Galerucella beetles continue to feed on and control Purple loosestrife.